If you are looking for a great home in a peaceful, country setting this one is a must see! 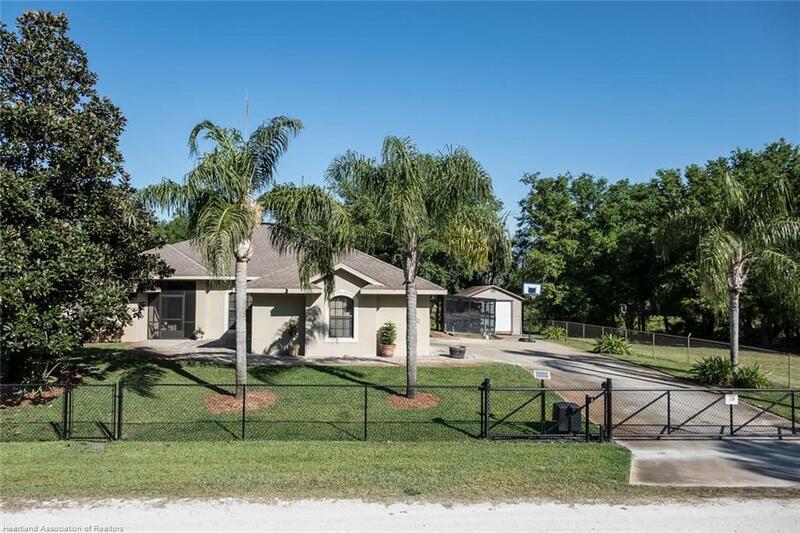 Beautiful 3BD/2BA/2 car garage plus golf cart bay is situated on over a half acre of land and is fully fenced (with solar power gate). Beautiful brick pavers lead to the screened entrance of this magnificent home. Solid wood multi-level cabinets throughout the kitchen, gas stove for the chef at heart, granite counter tops, double sink, top of the line appliances and large pantry. Bamboo wood flooring throughout, custom Hunter Douglas silhouette and wood blinds. Spacious master suite, tray ceiling, 2 walk-in closets, dual sinks, walk-in shower and garden tub. French doors on one of the guest bedrooms that could make a great office. Indoor laundry room with built-in desk area, gas dryer, sink, cabinets, extra storage area and granite counter tops. Shed/Workshop with AC. Canal in the rear of the house flows into Wolf Lake and offers great boating, fishing etc. Many other additional features to this home. This property is being offered below appraised value. Make an appointment to see today.